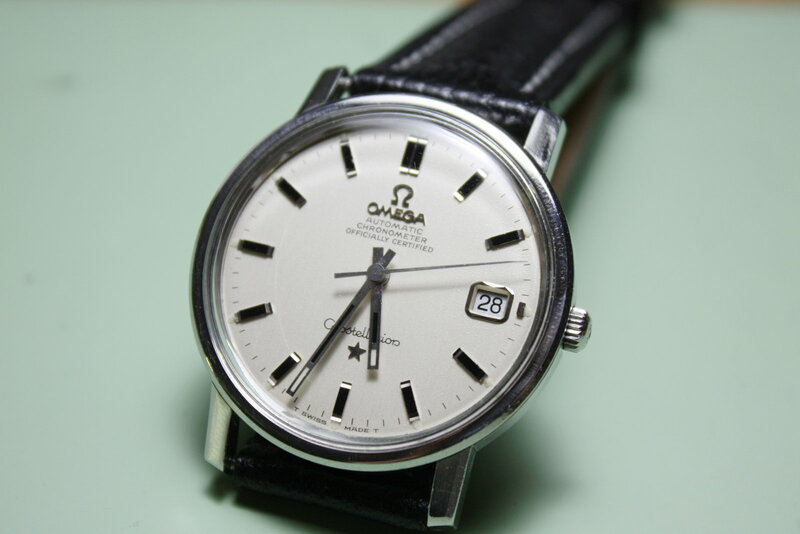 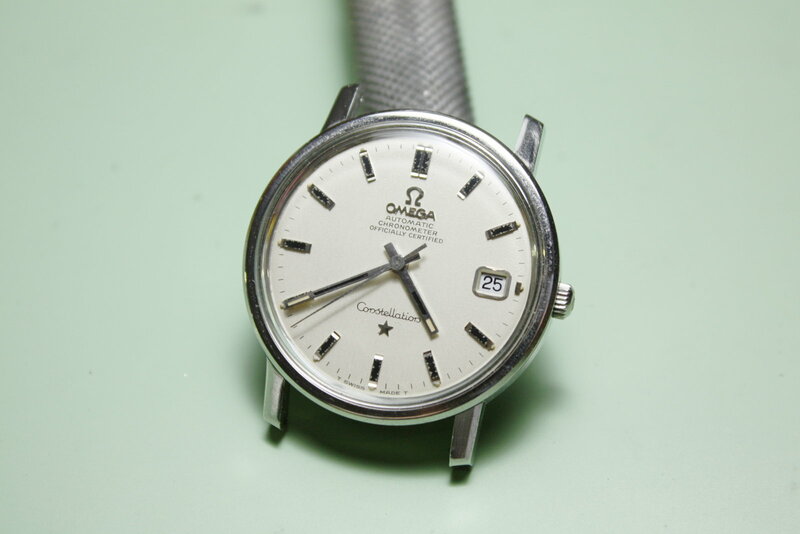 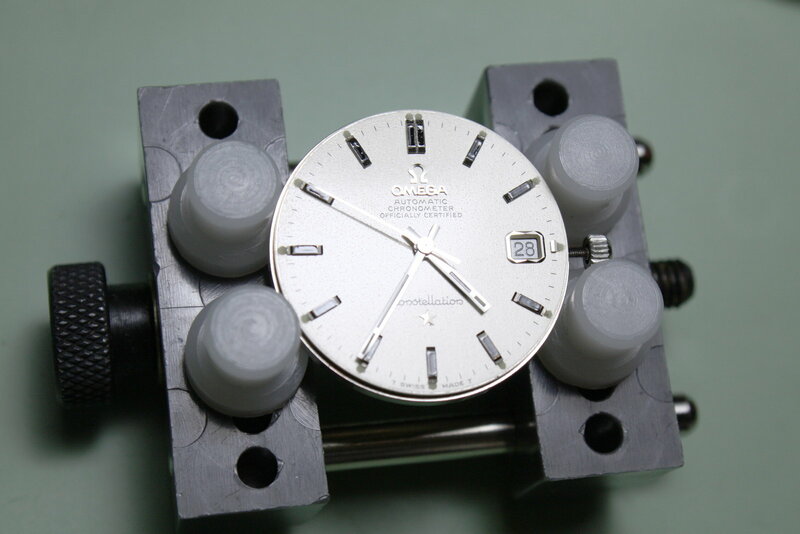 This time an Omega Constellation from 1967 with the caliber 564...some people out there think that this is one of the best watch movements ever produced (regarding design, quality and so on). 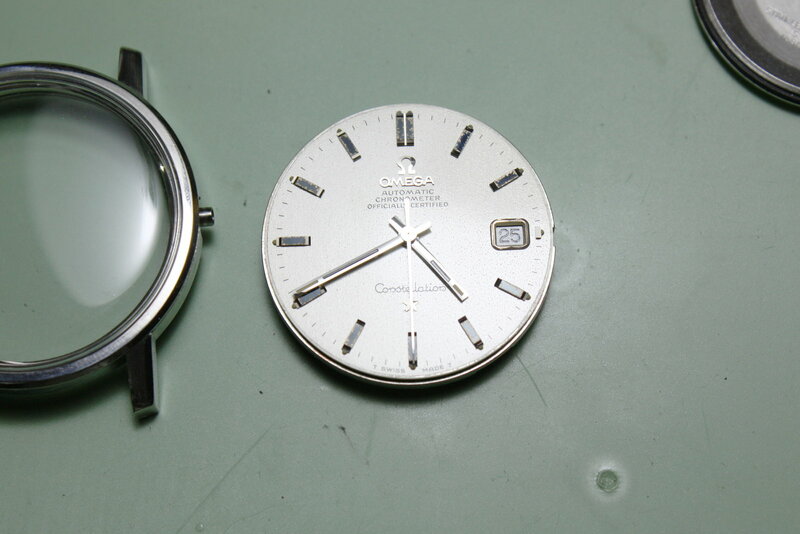 But let´s see the watch first. 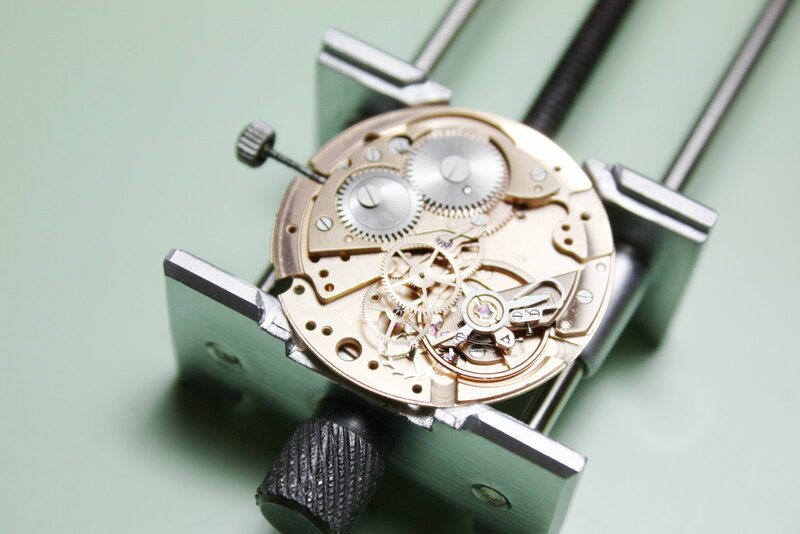 Highlights are the detailed specs on the autobridge (jewel count, adjustment infos), the rotor´s exquisite shape, the balance and its fine swan neck regulation...and indeed polished screw tips - yes, not only the heads are polished - the tips, too). 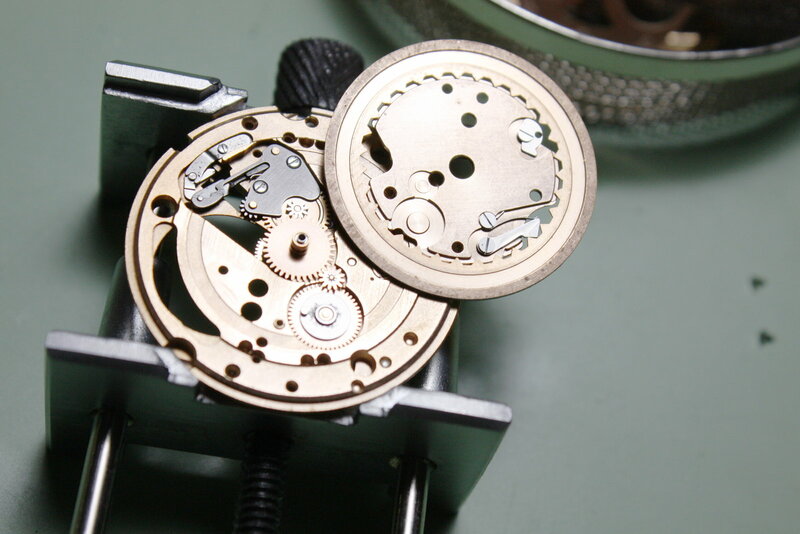 Despite some minor traces of neglect (missing oil) and humidity (fine initial rust here and there) and a slightly worn rotor bearing (notice the scratches on top of the rotor?) 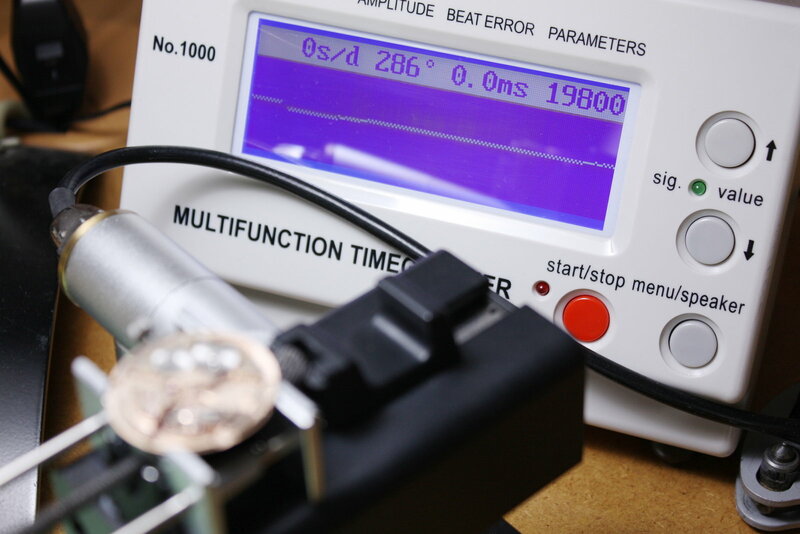 everything is functioning as it should. 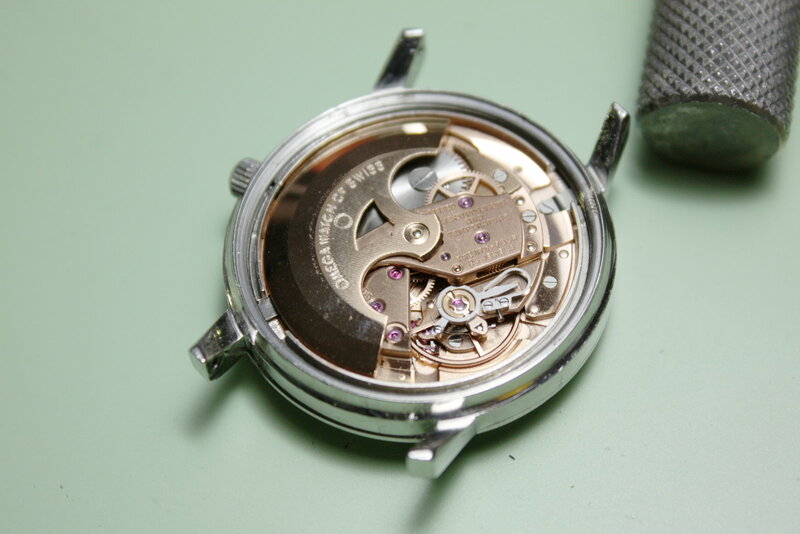 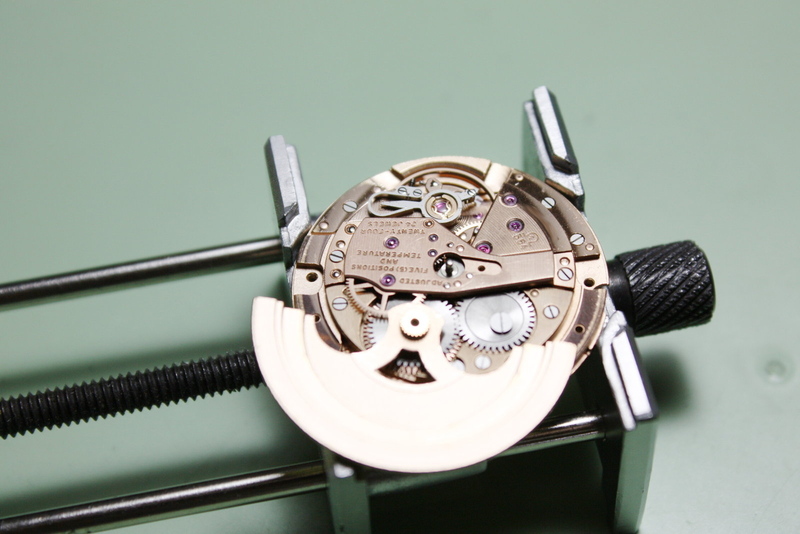 Above, the movement with dial and hands next to the case. 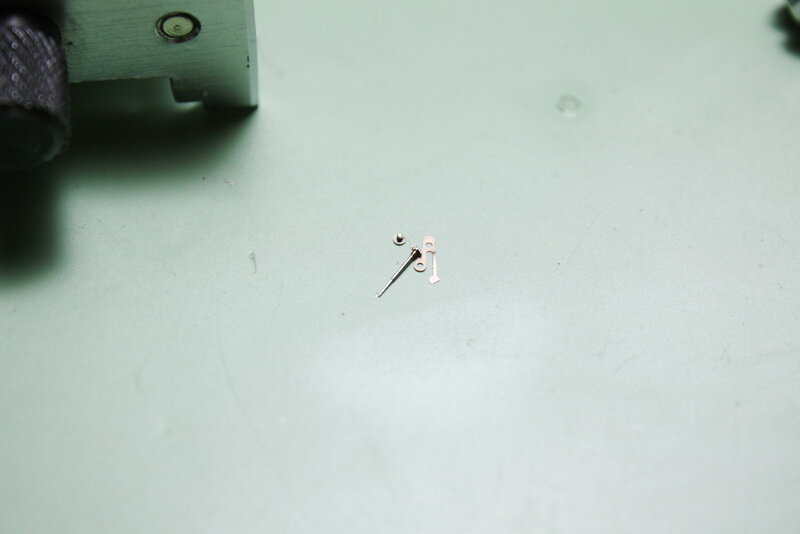 With the latter removed, the nice polish of the date indicator guard becomes visible. 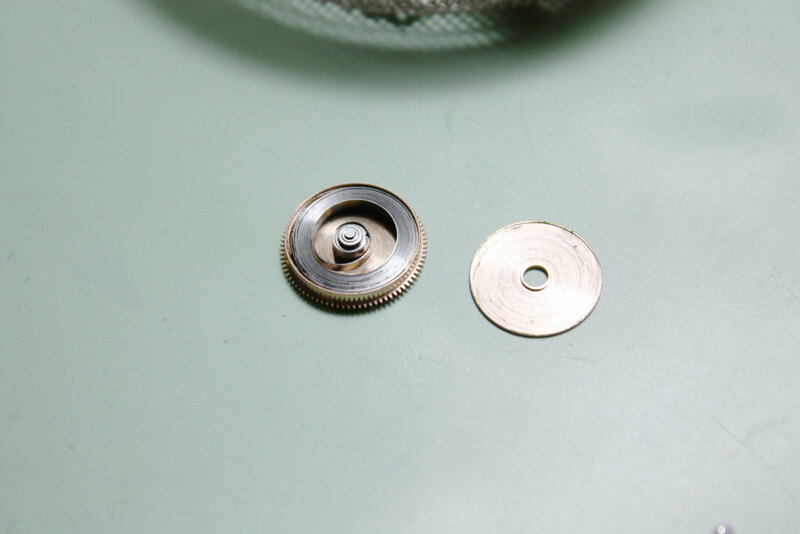 The second hand´s pinion is driven indirectly and has a retention spring that holds it down a bit to stabilize it and ensure that it moves continuously. 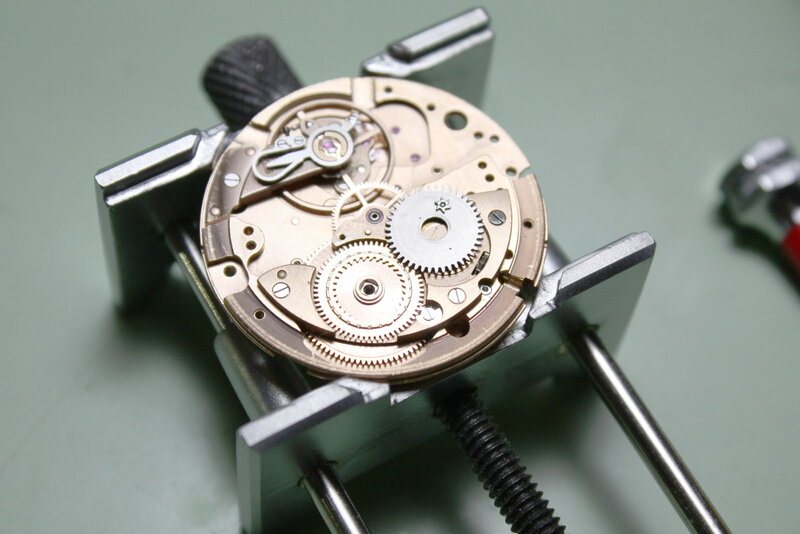 The movement has been serviced well by the previous owner / watchmaker -> There´s still some oil under the crown wheel, not bad. 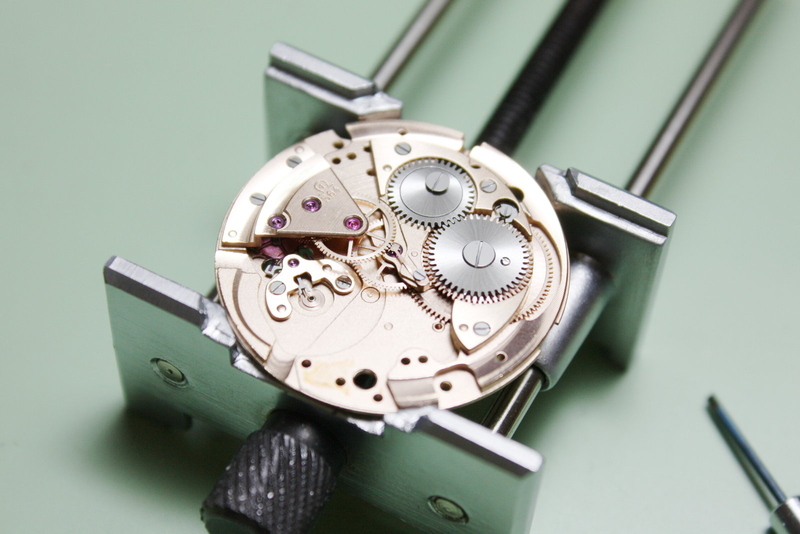 The automatic ratchet wheel is a perfect example for the ingenuity - almost over-engineering - of the Omega 564 movement´s creators: The small satellite pinion on the ratchet wheel´s underside (almost centered on the photo) allows for unidirectional-only automatic / manual winding and prevents the wheel from turning into the other direction. 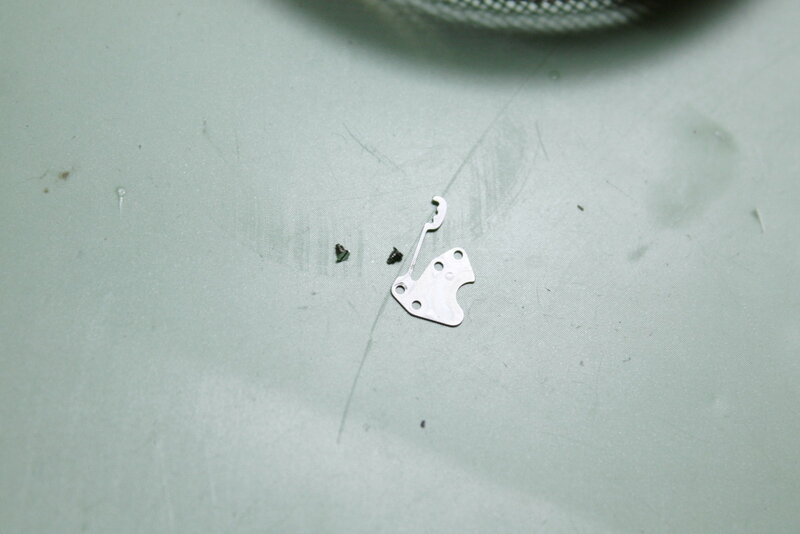 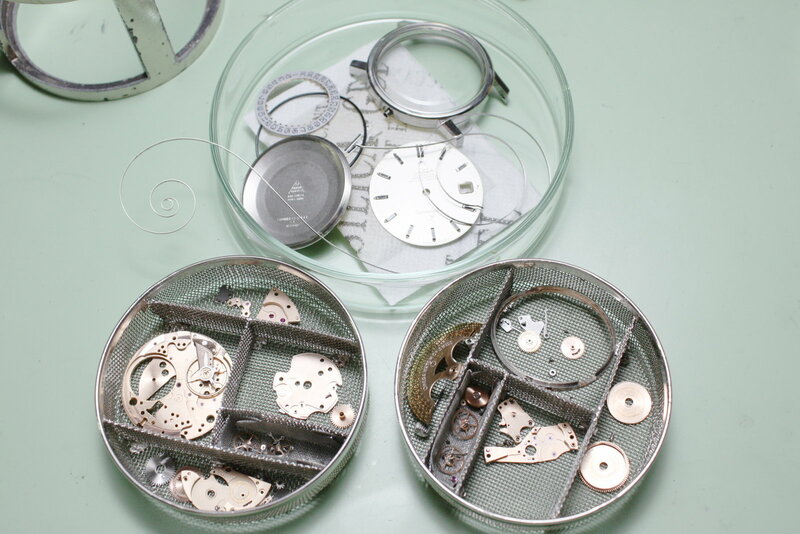 All the parts before cleaning, including the unwound, "S"-shaped mainspring above. 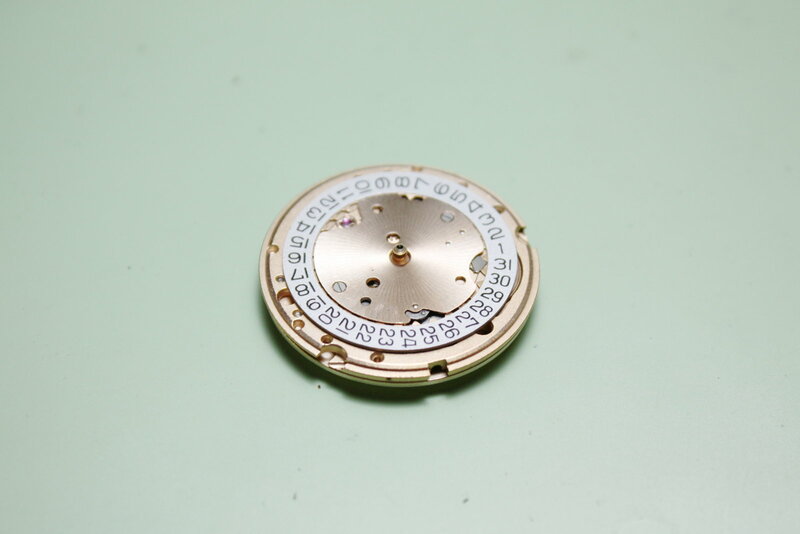 Here the re-enameled markers (the earlier Constellations from the late 1950s / early 1960s - a.k.a. 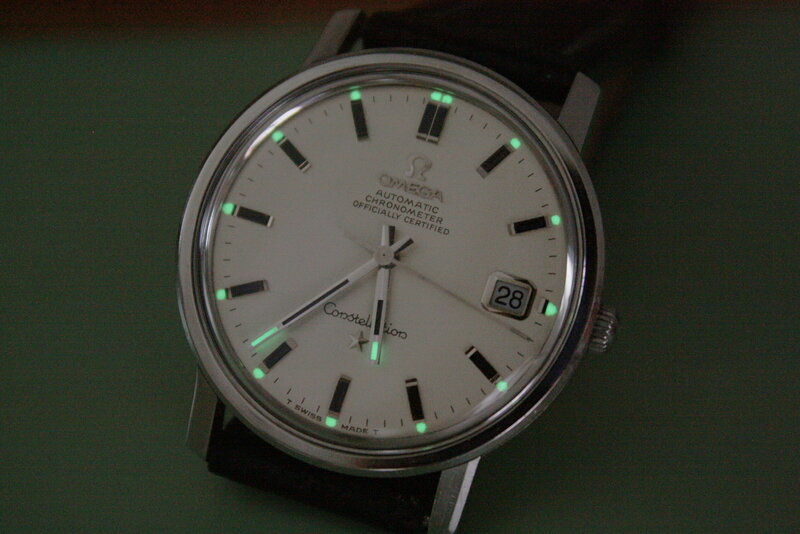 the "PiePans" for their pan-like dial design - still had non-aging Onyx markers...), the re-polished applications (Omega text, logo, star, date window) and the new luminous compound (I have slightly increased the dot size of the luminous markers to allow for a better night-visibility). 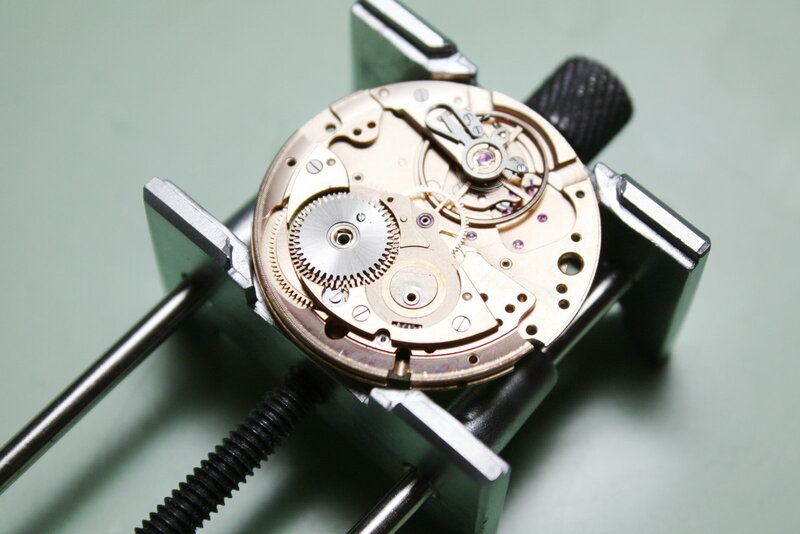 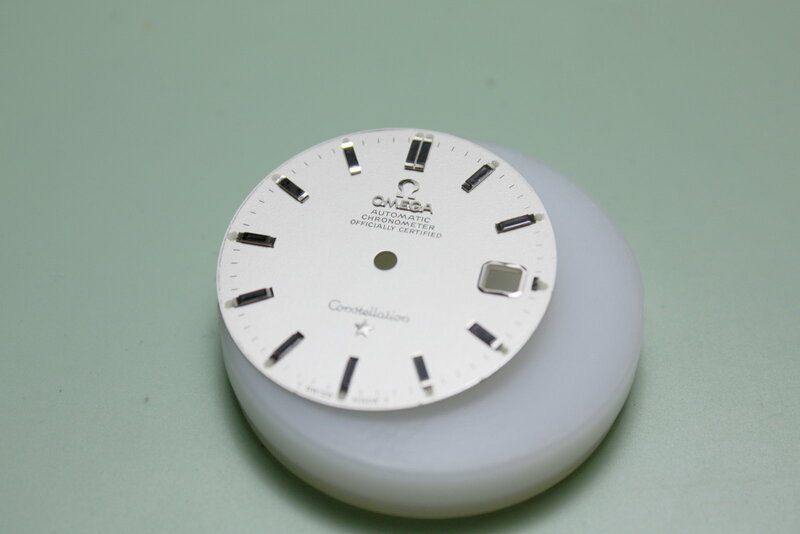 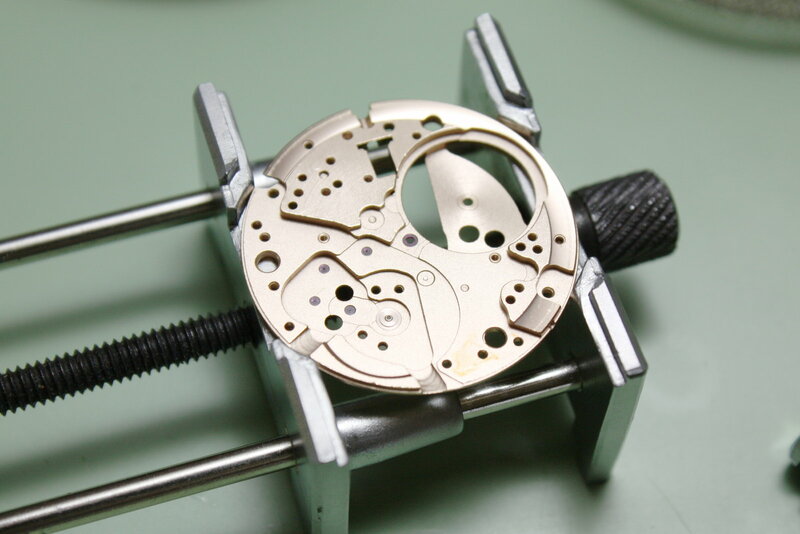 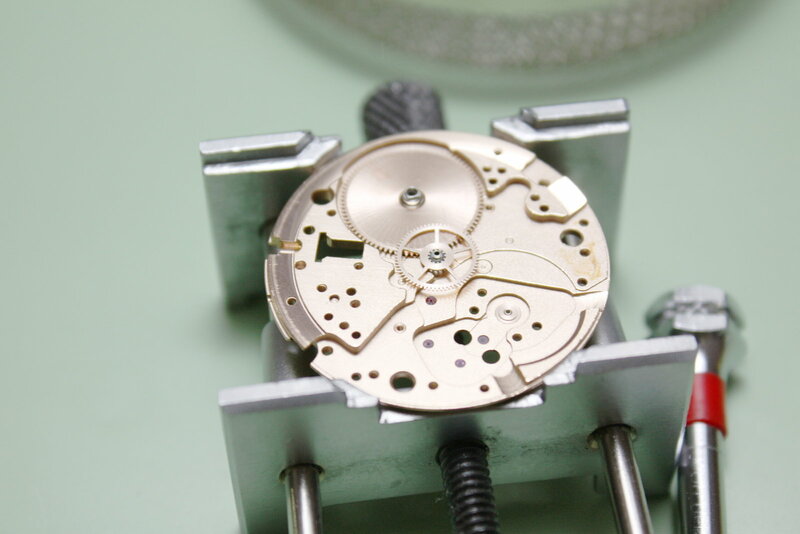 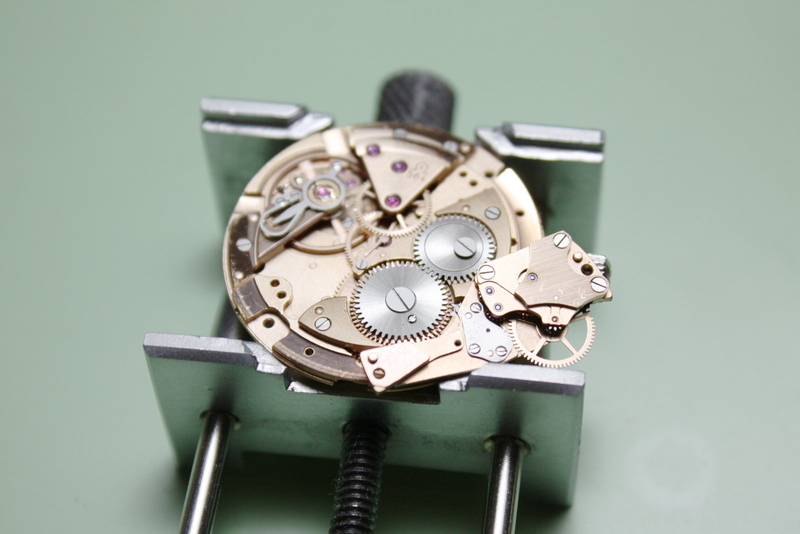 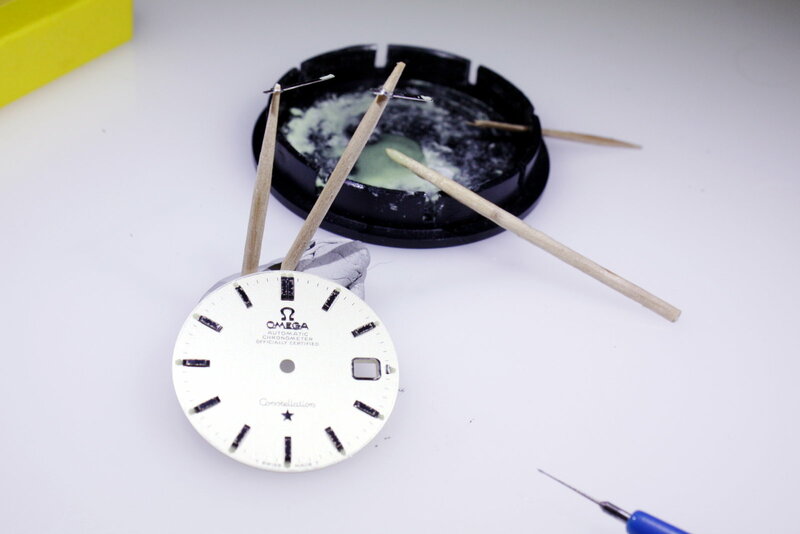 The cleaned and relubricated watch movement. 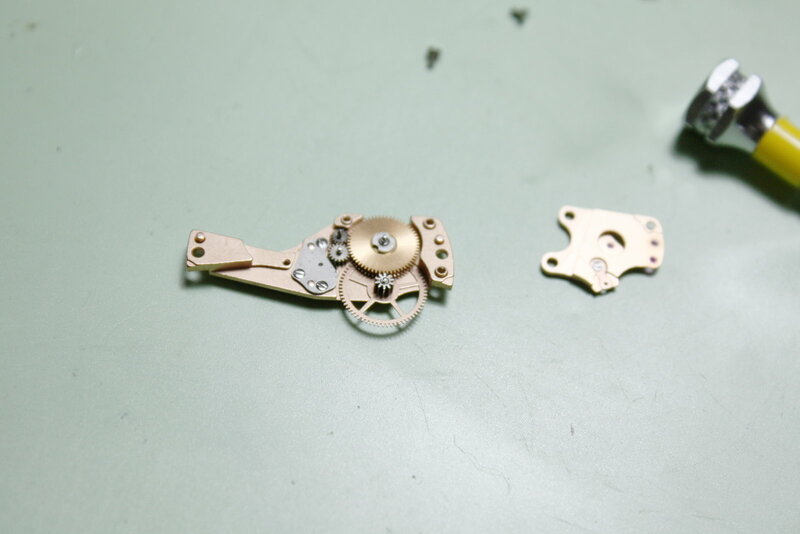 My verdict regarding the movement? 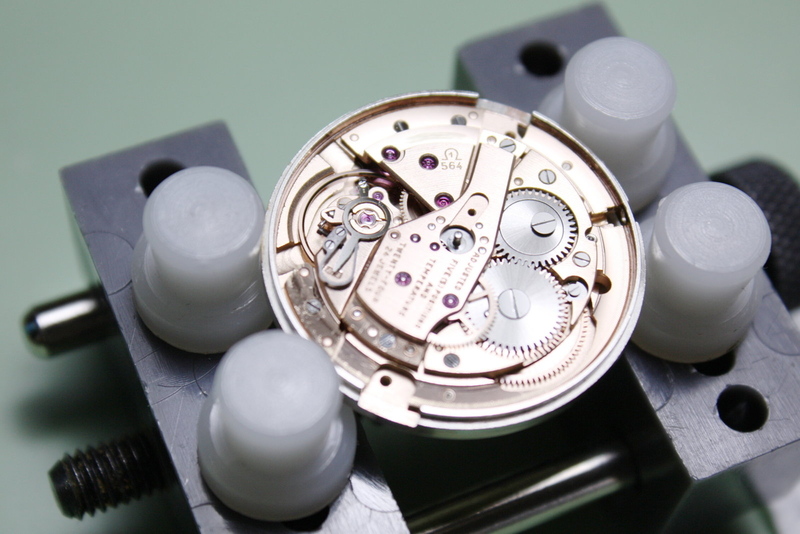 Outstanding quality and the best movement finish one can wish for. 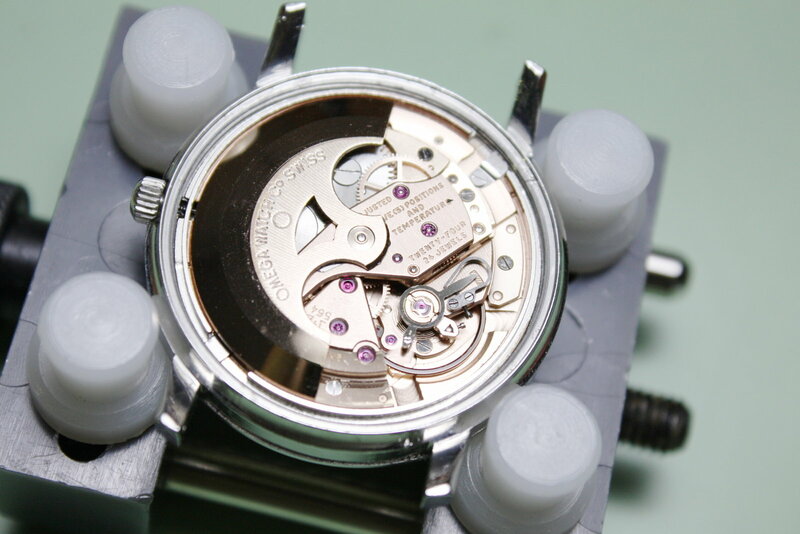 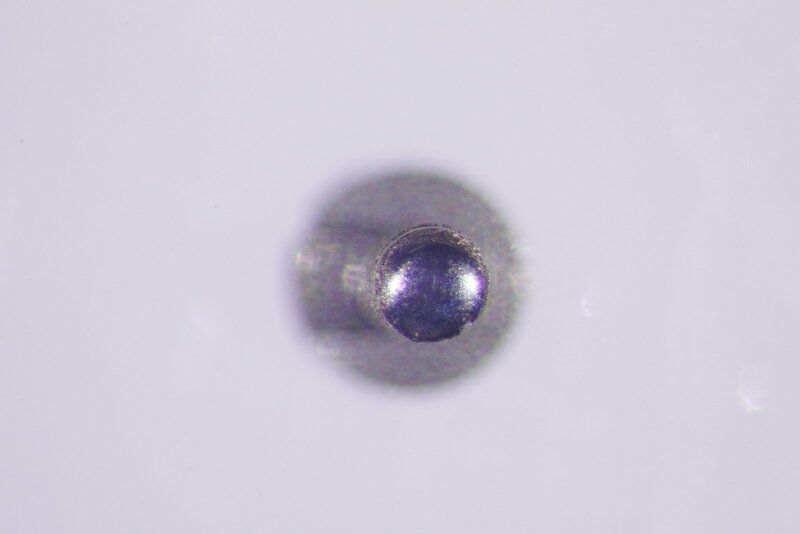 If they could have combined it with Eterna´s ball-bearing rotor or a Magic-lever-like construction (Seiko did this, without manual winding capability, sadly) - patents, I know - it would be almost too much :-).